There have been some problems with the new Delicious site after it was relaunched the other week. One thing I discovered today is that when you use the Delicious bookmarklet to save links, it automatically saves all links as soon as you click the bookmarklet, i.e. as soon as the pop-up window opens. Take a look at this short screencast to see how it works. It shows you my collection of Delicious bookmarks. Then I go to an article that I wish to save on Delicious. I click the “save on delicious” bookmarklet and the pop-up window immediately says that the link is saved. I didn’t click on Save, so the link is saved without tags and in my case automatically tweeted to my 3,000+ followers. As you may see in the video, although the box “this link is private” is ticked, the link is saved as Public. When you save a link directly on Delicious.com, it is also saved automatically before you hit the Save button (and are able to add tags), but at least there you are able to choose Private mode before it is saved to the site. I use Delicious every day and for a number of reasons, many of the links that I save are not meant to be public. I hope Delicious/AVOS will fix this problem soon. Social bookmarking site Delicious was recently bought by AVOS, a company owned by YouTube founders Chad Hurley and Steve Chen. A new version of Delicious was launched a few days ago and it includes a new sleek design and new features such as the ability to create “stacks”, a form of curated bundle of links within any topic. This no longer works so I need to find the updated RSS feed. You can find it under your profile image on your Delicious page. 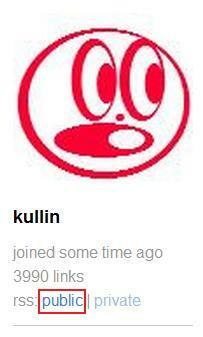 The new RSS feed is http://del.icio.us/v2/rss/kullin (basically the only difference is the addition of /vs/ ) and yours will look the same, just replace “kullin” with your username. To publish your links on Twitter, register with Twitterfeed.com and create a new feed. Paste the RSS link and then tick the box for making the feed active (you can do this later if you want to try first). Then go to advanced settings. There you choose posting frequency, titles etc and you can also add a prefix/suffix to the tweet to explain to your followers that this link is from Delicious. The last step is to choose what networks to publish the feed on, for example Twitter, Facebook or LinkedIn. Connect with your Twitter account and you are done. New Delicious offers a wide range of RSS feeds and if you want to subscribe to friends, other users, topics or keywords you can create your own tailored feed and then paste it into an RSS reader like Google Reader. These feeds can be found here. Do you post all your Gowalla and Foursquare check-ins to your Facebook profile, as well as your tweets, Delicious bookmarks and TripIt travels? Chances are, you are starting to become as dull as dishwater to your Facebook friends. Sharing is caring, but oversharing might not be the ultimate way to add value to your network. A new study by Christopher Sibona, a PhD student at the University of Colorado at Denver, investigated why people unfriend someone on Facebook. The study, which surveyed some 1,500 Facebook users, found that 57 percent of those surveyed unfriended for online reasons, while 26.9 percent did so for offline behavior. The number one reason for unfriending someone on Facebook was “frequent, unimportant posts”. The second reason was posting about polarizing topics like religion and politics. Third reason for being unfriended was posting inappropriate posts, such as crude or racist comments. – Problogger gets banned and unbanned from StumbleUpon. Maybe it was just his email that got him unbanned in less than two hours, but the responses from social media friends via Twitter, Plurk, Digg and email probably also helped. – del.icio.us launches new faster version of the site with better search and new design. The site also now redirects you from for example del.icio.us/kullin to delicious.com/kullin which seems a bit unnecessary, but maybe they’ve finally realized that the original domain was too complicated. You need to log on to your account again in order to save links, which might be a problem for users that don’t remember their password. Another downside with the new design is that you don’t see all your tags on the screen without scrolling, but apart from that the new design looks good.